In one embodiment, an array of packages may comprise two or more different sizes of disposable absorbent articles. The Product Waist-to-Side Silhouette of a second absorbent article may be equal to or greater than a Product Waist-to-Side Silhouette of a first absorbent article. And, an Array Average Product Waist-to-Side Silhouette of first and second packages of the array may be from about 1.7 to about 6.0. FIELD OF THE INVENTION The present disclosure is directed to disposable absorbent articles and arrays of disposable absorbent articles which are designed to fit different adult body sizes, shapes and types, and as such are sized to fit a broad range of adult consumers. BACKGROUND OF THE INVENTION The Waist Circumference and Side Length are illustrated in Fig. 1. The relationship of the Waist Circumference to Side Length (Waist Circumference-to-Side Length Ratio), as illustrated in Fig. 2, is an important product design parameter to ensure that the Relaxed Side Length of the article is not excessive nor too short. Excessive article Relaxed Side Length can result in material showing above the top of the clothing. And too short an article Relaxed Side length can result in too little coverage and product gapping, all of which can have a negative impact on performance and discretion. A proper side length will ensure the proper location of the product at the hip and or waist of the wearer. The Hip Circumference measurement, due to the relationship to the prominent point of the buttocks, generally establishes the primary anchoring point of the absorbent article as it often represents the maximum circumference around the body. This is especially true for women who have a more cylindrical body shape or a more apple-like body shape. In alternative embodiments the Waist Circumference measurement can be the primary anchoring point of the absorbent article as it can represent the minimum circumference around the body especially for women who have a more hourglass body shape or a more pear-like body shape. This is a function of fit at the minimum circumference, which means the product circumference and as a result force at the waist would have to increase to slide or sag due to the increased body dimension at the hip. The Waist Width and Side Length are illustrated in Fig. 3. The Body Waist-to-Side Silhouette, as illustrated in Figs. 4 and 5, is correlated with the Waist Circumference-to-Side Length Ratio as the values of both increase as BMI and Waist Circumference increase. This is shown in Figs. 2, 4, and 5. As the Waist Circumference increases with BMI, Waist Circumference-to-Side Length Ratio and Body Waist-to-Side Silhouette both increase. A key benefit of having the Product Waist-to-Side Silhouette closer to that of the Body Waist-to-Side Silhouette and designed to change accordingly with BMI and Waist Circumference is that the product itself more closely matches the shape of the body. This results in the product being deformed to a significantly lesser degree during application than one that is generically designed to fit a bigger range as illustrated by the current marketed products. It also results in a product fit, which is more tailored to the body shape, providing more effective gasketing and better coverage and discretion. In fact, many of the current marketed products are designed to fit increments as large as 100 pounds and, as such do not provide adequate fit, gasketing, comfort and discretion across the entire range. Additionally, product designs which mimic the general shape of the body convey to consumers a better, more tailored fit as the Product Waist-to-Side Silhouettes are more similar to consumers' Body Waist-to-Side Silhouettes. The designs enabled by the present disclosure are more targeted by design, the product is located properly with respect to the waist and hip of the wearer and therefore provide a greater level of fit, gasketing, comfort and discretion. Adult incontinence ("AI") absorbent articles of the present disclosure may be used to absorb and contain liquid and other discharges from the human body to prevent the body and clothing from becoming soiled. For adults who suffer from urinary incontinence, urine voiding consists of two general types: stress urinary incontinence ("SUI") and urge urinary incontinence ("UUI"). SUI is caused by high pressure on the bladder induced by coughing, sneezing, laughing, bending, etc., and can result in a high flow rate though at a smaller urine volume that is associated with UUI. UUI can result in a full bladder release, though at a lower flow rate than that associated with SUI. Adult Incontinence articles come in a variety of designs, each typically available in multiple sizes, including 2, 3 and 4 size arrays. The size of articles of the prior art typically affects, for example, the size of the waist opening, the size of the openings around the thighs, and the length or "pitch" of the article. Many of these prior art articles are designed to fit ranges up to 100 pounds. The prior art articles are typically sized and sold by waist circumference dimension. The various sizes can have a range in waist circumference of as much as 12 inches and in some cases up to 16 inches. If a consumer selects an adult incontinence article of the prior art which is size appropriate based on the waist circumference dimension of the wearer given the large ranges associated with the various sizes, the thigh openings or pitch of the article, for instance, may be too large for proper fit on the wearer, potentially leading to slipping, sliding, sagging, drooping, or a loss of gasketing effects that are designed to inhibit leakage. Alternatively, depending on where the wearer is within the large size range, the thigh opening or pitch of the article may be too small for proper fit, potentially leading to wearer discomfort, skin marking of the wearer's skin or improper application or positioning of the article on the wearer. Desirably, an adult absorbent article should be designed and sized to maintain contact with and conform as closely as possible to a wearer's body. Such a body-conforming design may increase the effectiveness of the adult absorbent article by reducing the possibility that urine, or the like, will spread or travel along the wearer's body and leak out of rather than be absorbed into the adult absorbent article. However, current adult absorbent articles on the market do not adequately address body shape or product shape and therefore do not fit a broad range of users adequately or provide the desired level of close fit. Typically AI packages of adult absorbent articles are labeled with a recommended wearer waist circumference range that the packaged article is intended to fit. As a result, the waist circumference is often the sole criteria used to identify the size of an AI article. The waist size does not in itself adequately describe the body shape of the individual and therefore does not help define the hip or thigh circumference nor the pitch that may be needed to provide the proper fit, comfort, coverage and gasketing of the article. This is the case even though other characteristics and anthropometric attributes of potential wearers (for example, age, height, weight, thigh circumference, and rise) may vary widely within the recommended waist circumference range, and may result in an ill-fitting article even though a wearer's waist circumference falls within that range. There is a need for adult absorbent articles that conform well to various wearers' body shapes and sizes. While there is a wide range of body shapes and sizes among women, available products do not reflect this wide range; rather, absorbent articles available today within a given product array tend to be scaled versions of each other, and do not even follow the natural trend of body shape and dimensional changes across the range of consumers, i.e. smaller to larger women as well as women of varying shape. Body Mass Index (BMI) is on the rise globally for both men and women. In the U.S. alone, more than 1/3 of adult females are now considered obese (BMI > 30). This has changed significantly over the past 30 years; in 1980 only about 16% of U.S. adult females were obese. Larger women exhibit different ratios of body anthropometrics than smaller women, i.e., all body dimensions do not simply scale-up as women get larger. In addition, women across the range of BMI may also have very different body shapes. There is a lack of recognition and understanding of this issue by current adult absorbent article manufacturers and as such consumers' needs are not being adequately met. Therefore, there is a need to develop adult absorbent articles for a wide variety of body shapes and sizes in order to provide an improved level of fit and contact between the body and the adult absorbent article to reduce the occurrence leakage and improve the overall fit, comfort, coverage and discretion of the article. There is a clear need for adult absorbent articles which are designed for variety of wearers based on their BMI and body shape. There is also a need to communicate to wearers the benefits of such customized adult absorbent articles in an easy-to-understand manner (e.g., some women may not understand what BMI is or know their BMI number), which is not off-putting (e.g., without stigmatizing or embarrassing women based on their BMI). In one embodiment, an array of packages may comprise two or more different sizes of disposable absorbent articles. The array may comprise first and second packages comprising first and second disposable absorbent articles. Each of the first and second absorbent articles may comprise a topsheet, backsheet, absorbent core and a pair of side seams. The first absorbent article may be a first size and may be in a closed form. The second absorbent article may be a second size and may also be in a closed form. The second absorbent article may have one or more of (a) larger Relaxed Product Side Length (303) than the first absorbent article or (b) a larger Relaxed Product Waist Width (302) than the first absorbent article. The Product Waist-to- Side Silhouette of the second absorbent article may be equal to or greater than a Product Waist- to-Side Silhouette of the first absorbent article. And, the first and second packages may comprise the same brand name and/or sub-brand name. In another embodiment, an array of packages may comprise two or more different sizes of disposable absorbent articles. The array may comprise first and second packages comprising first and second disposable absorbent articles. Each of the first and second absorbent articles may comprise a topsheet, backsheet, absorbent core and a pair of side seams. The first absorbent article may be a first size and may be in a closed form. The second absorbent article may be a second size, different from the first size, and may also be in a closed form. An Array Average Product Waist-to-Side Silhouette of the first and second packages may be from about 1.7 to about 6.0. And, the first and second packages may comprise the same brand name and/or sub- brand name. In another embodiment, an adult incontinence disposable absorbent article may have a Product Waist-to-Side Silhouette from 1.7 to about 6.0. And, the adult incontinence disposable absorbent article may be in a closed form. In a fourth embodiment, an On-Line Array of packages may comprise two or more different sizes of disposable absorbent articles. The array may comprise first and second packages comprising first and second disposable absorbent articles. Each of the first and second absorbent articles may comprise a topsheet, backsheet, absorbent core and a pair of side seams. The first absorbent article may be a first size and may be in a closed form. The second absorbent article may be a second size and may also be in a closed form. The second absorbent article may have one or more of (a) larger Relaxed Product Side Length (303) than the first absorbent article or (b) a larger Relaxed Product Waist Width (302) than the first absorbent article. The Product Waist-to-Side Silhouette of the second absorbent article may be equal to or greater than a Product Waist-to-side Silhouette of the first absorbent article. And, the first and second packages may comprise the same brand name and/or sub-brand name. Figure 1 shows Waist Circumference and Side Length against a female body shape. Figure 2 is a chart which shows how the average ratio of Waist Circumference-to-Side Length Ratio changes as Waist Circumference increases. Figure 3 shows Waist Width and Side Length against a female body shape. Figure 4 is a chart which shows how the average Body Waist-to-Side Silhouette changes as BMI increases. Figure 5 is a chart which shows how the average Body Waist-to-Side Silhouette changes as waist circumference increases. Figure 6 shows an AI pant product in its laid out, relaxed, and unfolded state. Figure 7 shows how the general female body shape changes as BMI increases. Figure 8 depicts the variability of female body shapes within each BMI class. 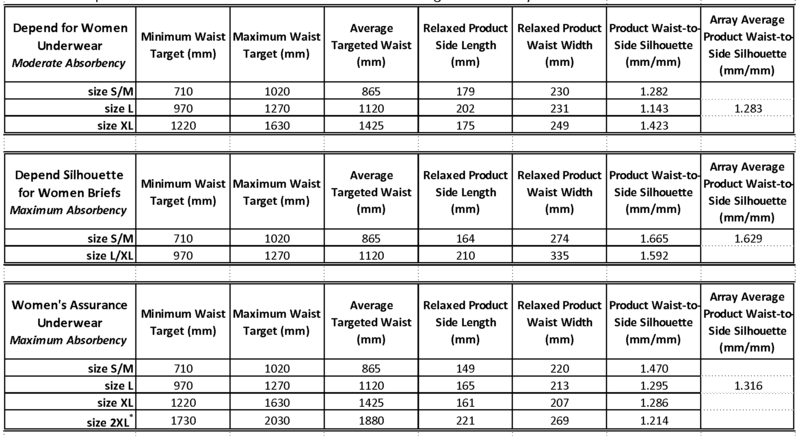 Figure 9 is a chart which shows examples of existing product arrays, and how their Product Waist-to-Side Silhouettes compare to the Body Waist-to-Side Silhouettes of the waist circumferences of the consumers each product is targeted to fit. Figure 10 is a chart which shows examples of inventive product arrays, and how their Product Waist-to-Side Silhouettes compare to the Body Waist-to-Side Silhouettes of the waist circumferences of the consumers each product is targeted to fit. Figure 11 is a chart which shows examples of inventive product arrays, and how their Product Waist-to-Side Silhouettes compare to the Body Waist-to-Side Silhouettes of the BMI of the consumers each product is targeted to fit. Figure 12 is a plan view of a pant diaper with a continuous belt in the front and back waist regions. Figure 15 is a perspective view the pant diaper shown in Figure 12 wherein belts connect opposing waist regions. Figure 16 is a perspective view the pant diaper shown in Figure 13 wherein flaps connect opposing waist regions. Figure 17 is a perspective view the pant diaper shown in Figure 14 wherein side seams connect the flaps and opposing waist regions. FIG. 18 is a schematic cross section view taken along line 18-18 in FIG. 13 of an example of a folded outer leg cuff suitable in one embodiment of the invention. Figure 19 is a schematic cross section view of a back belt-like flap suitable in one embodiment of the invention, taken along line 19-19 of Figure 12. Figure 21 shows a flat, unfolded pant. Figure 22 shows a pant in the testing apparatus. "Pull-on garment" or "pant" means articles of wear which have a defined waist opening and a pair of leg openings and which are pulled onto the body of the wearer by inserting the legs into the leg openings and pulling the article up over the waist. "Waist Circumference" means the horizontal circumference of the waist at the level of the center of the navel (omphalion). See Fig. 1. "Waist Width" is defined as the width of the body measured horizontally in the front of the body at the omphalion (center of navel). See Fig. 3. "Side Length" means the vertical distance from the navel to the level of the hip (where the hips are defined at the maximum prominent point of the buttocks as seen from the side. See Fig. 3. "Waist Circumference-to-Side Length Ratio" means the Waist Circumference (mm) divided by the Side Length (mm). See Fig. 1. "Body Waist-to-Side Silhouette" means the Waist Width (mm) divided by the Side Length (mm). See Fig. 3. "Product Waist-to-Side Silhouette" means Relaxed Product Waist Width (302) (mm) divided by the Relaxed Product Side Length (303) (mm). See Fig. 6. "Array Average Product Waist-to-Side Silhouette" means the average Product Waist-to- Side Silhouette of each size offered in a product array. For example, the Depend Underwear for Women (Maximum Absorbency) is marketed and sold in an array of 3 sizes: Small/Medium; Large and Extra Large. The Array Average Product Waist-to-Side Silhouette is the average of: The Product Waist-to-Side Silhouette for size Small/Medium; the Product Waist-to-Side Silhouette for size Large; and the Product Waist-to-Side Silhouette for size Extra Large. Table 1 shows examples of the Product Waist-to-Side Silhouette for some currently marketed product arrays. "Relaxed Product Length" means the longitudinal distance between the longitudinally distal most point in the crotch region and the longitudinally distal most point along the front waist edge. The longitudinal distance is measured parallel to the longitudinal axis of the product. Refer to Fig. 6. "Relaxed Product Hip Width" means the lateral distance from the laterally distal most point of the left side edge of the product at the upper edge of the left leg opening to the laterally distal most point of the right side edge of the product at the upper edge of the right leg opening. Refer to Fig. 6. The lateral distance is measured perpendicular to the longitudinal axis of the product. "Relaxed Product Waist Width" means the lateral distance from the distal most point at the right side of the front waist edge to the distal most point at the left side of the front waist edge. The lateral distance is measured perpendicular to the longitudinal axis of the product. Refer to Fig. 6. "Relaxed Product Side Length" means the linear distance from the point of intersection between the waist edge and the side edge of the product to the point of intersection between the top of the leg opening and the same side edge of the product. The relaxed product side length measurement is the average of the measurements from the left and right sides of the product. Refer to Fig. 6. "Target Waist Range" means the waist range as defined on each product package. For example, the Depend for Women Moderate Absorbency S/M package indicates a waist of 28-40 in (71-102 cm). "Average Targeted Waist" means the average of the Target Waist Range. For example, the Depend for Women Moderate Absorbency S/M has a Target Waist Range (as defined on its package) of 71 - 102 cm. The Average Targeted Waist for this product is 86.5 cm. The BMI comprises different classes of body mass, including: underweight (BMI <20), normal weight (BMI 20-25), overweight (BMI 25-30), obese (BMI 30-40), and morbidly obese (BMI > 40). FIG. 7 illustrates how the general female body shape changes as BMI increases. FIG. 8 illustrates a variety of specific shapes that may exist within each BMI class: rectangle (also known as cylindrical), hourglass, pear, and apple. The higher her BMI, the further to the right (toward the apple) a women typically is on this body shape scale. The prevalence of these shapes differs among BMI ranges, for instance, higher BMI women have a higher probability of being apple or pear shaped. Adult absorbent articles may be marketed to women of a particular body shape, such as apple, rather than focusing on exact BMI values (which may be off-putting to a consumer), in order to match a wearer with the article that will best fit her unique body shape or size. Body Waist-to-Side Silhouette. The Body Waist-to-Side Silhouette gets larger on average for larger women. FIGS. 4 and 5 illustrate how the Body Waist-to-Side Silhouette changes as both BMI and Waist Circumference gets larger. It may be desirable to link the Product Waist-to-Side Silhouette to that of the targeted consumers Body Waist-to-Side Silhouette in order to achieve a better fitting, better conforming, better gasketing product. This may increase the wearing comfort for each consumer while reducing leakage. Additionally, a product array where the Product Waist-to-Side Silhouette of each subsequently larger size follows the same general trend as the Body Waist-to-Side Silhouette for each subsequently larger size may also deliver a better fitting, better conforming article to each consumer regardless of their respective BMI. While today's AI product arrays are not targeted toward the consumer's BMI, they are targeted toward their Waist Circumference. Table 1 details some of today's marketed product arrays ("comparative example arrays" or "existing product arrays"). FIG. 9 shows how the Product Waist-to-Side Silhouettes of these arrays compare to the consumers' Body Waist-to-Side Silhouettes. It can be seen that for these comparative example arrays, their Product Waist-to- Side Silhouettes not only fail to match those of their target consumers, but it can also be seen that the trend from size to size for the existing product arrays is that the Product Waist-to-Side Silhouettes get smaller rather than larger as do the Body Waist-to-Side Silhouettes of the consumers. The result of this mismatch is that the products provide an inferior level of fit, comfort, coverage and gasketing across much of the BMI range than products that are designed in line with the anthropometric measures across the same BMI range. In one embodiment, an absorbent article may comprise a chassis comprising a topsheet, a backsheet, and an absorbent core disposed at least partially between the topsheet and the backsheet. The absorbent chassis may comprise a waistband, leg cuffs and or elastic strands. In various embodiments, referring to Figs. 12, an example absorbent article 10 is shown in its flat uncontracted state prior to joining the fastening components 53a and b. In one embodiment, referring to Fig. 12, one end portion of the absorbent article 10 may be configured as a front waist region 36 and the longitudinally opposing end portion may be configured as a back waist region 38. An intermediate portion of the absorbent article 10 extending longitudinally between the front waist region 36 and the back waist region 38 may be configured as a crotch region 37. In one embodiment, although not illustrated as such, the length of each of the front waist region 36, the back waist region 38 and the crotch region 37 may be about 1/3 of the length of the absorbent article 10, for example. In other embodiments, the length of each of the front waist region 36, the back waist region 38, and the crotch region 37 may have other dimensions. In various embodiments, the absorbent article 10 may have a laterally extending front waist end edge 136 in the front waist region 36 and a longitudinally opposing and laterally extending back waist end edge 138 in the back waist region 38. In one embodiment, referring to Fig. 12, a chassis 100 of the absorbent article 10 may comprise a first longitudinally extending side edge 137a and a laterally opposing and second longitudinally extending side edge 137b. Both of the side edges 137 may extend longitudinally between the front waist end edge 136 and the back waist end edge 138. The chassis 100 may form a portion of the laterally extending front waist end edge 136 in the front waist region 36 and a portion of the longitudinally opposing and laterally extending back waist end edge 138 in the back waist region 38. Furthermore, the chassis 100 may comprise an interior surface 102, an exterior surface 104, a longitudinal axis 42, and a lateral axis 44. The longitudinal axis 42 may extend through a midpoint of the front waist end edge 136 and through a midpoint of the back waist end edge 138, while the lateral axis 44 may extend through a midpoint of the first side edge 137a and through a midpoint of the second side edge 137b. In one embodiment, referring to Figs. 12 and 19, the absorbent article 10 may comprise a topsheet 81. The topsheet 81 may be compliant, soft feeling, and non-irritating to the wearer's skin and may be elastically stretchable in one or more directions. Further, the topsheet 81 may be liquid pervious, permitting liquids (e.g., menses, urine, and/or runny feces) to penetrate through its thickness. Various topsheets may also comprise a hydrophilic material, for example, which is configured to draw bodily fluids into an absorbent core of the chassis 100 when these fluids are expelled from the body. A suitable topsheet 81 may be manufactured from a wide range of materials, such as woven and nonwoven materials, apertured or hydroformed thermoplastic films, apertured nonwovens, porous foams, reticulated foams, reticulated thermoplastic films, and/or thermoplastic scrims, for example. Suitable apertured films may comprise those described in U.S. Pat. Nos. 3,929,135, 4,324,246, 4,342,314, 4,463,045, 5,006,394, 5,628,097, 5,916,661, 6,545,197, and 6,107,539. The topsheet may comprise a skin care lotion. Examples of suitable lotions include, but are not limited to, those described in U.S. Pat. Nos. 5,607,760; 5,609,587; 5,635,191; 5,643,588; and 5,968,025, and as described in U.S. Application No. 61/391,353. In one embodiment, the topsheet may comprise graphics (e.g., 116 in Fig. 15) such that depth perception is created as described in U.S. Pat. No. 7,163,528. One suitable material for the backsheet can be a liquid impervious thermoplastic film having a thickness of from about 0.012 mm (0.50 mil) to about 0.051 mm (2.0 mils), for example including polyethylene or polypropylene. Typically, the backsheet can have a basis weight of from about 5 g/m 2 to about 35 g/m 2. The backsheet can be typically positioned adjacent the outer-facing surface of the absorbent core and can be joined thereto. For example, the backsheet may be secured to the absorbent core by a uniform continuous layer of adhesive, a patterned layer of adhesive, or an array of separate lines, spirals, or spots of adhesive. Illustrative, but non- limiting adhesives, include adhesives manufactured by H. B. Fuller Company of St. Paul, Minn., U.S.A., and marketed as HL-1358J. An example of a suitable attachment device including an open pattern network of filaments of adhesive is disclosed in U.S. Pat. No. 4,573,986. Another suitable attachment device including several lines of adhesive filaments swirled into a spiral pattern is illustrated by the apparatus and methods shown in U.S. Pat. Nos. 3,911,173; 4,785,996; and 4,842,666. Alternatively, the attachment device may include heat bonds, pressure bonds, ultrasonic bonds, dynamic mechanical bonds, or any other suitable attachment device or combinations of these attachment devices. In one embodiment, the core may be separable from the chassis as disclosed in U.S. Pat. Nos. 6,989,006; 7,381,202; 7,175,613; 7,824,386; 7,766,887; and 6,989,005. In such embodiments, the measurements described in this disclosure may be made to the chassis alone or may be made to the chassis in combination with the separable core/absorbent assembly. In one embodiment, referring to Figs. 13 and 14, the chassis 100 of the absorbent article 10 may comprise longitudinally extending and laterally opposing leg cuffs 147a and 147b that are disposed on the interior surface of the chassis 100 that faces inwardly toward the wearer and contacts the wearer. The leg cuffs 147a and 147b may comprise one or more elastic gathering members disposed at or adjacent the proximal edge of one or both of the leg cuffs 147. In addition, the elastic gathering members of the leg cuff may also comprise one or more elastic strands 146 disposed at or adjacent the distal edge of one or both of the leg cuffs 147. The elasticized leg cuffs 147 may comprise several embodiments for reducing the leakage of body exudates or fluids in the leg regions. The elasticized leg cuffs 147 are sometimes referred to as leg bands, barrier cuffs, elastic cuffs, or gasketing cuffs. Suitable elasticized leg cuffs 147 may comprise those described in U.S. Pat. Nos. 3,860,003, 4,909,803, 4,695,278, 4,795,454, 4,704,115, and 4,909,803, and U.S. Pat. Publ. No. 2009/0312730. The leg cuffs 147 may be formed by folding portions of the chassis 100 laterally inward, i.e., toward the longitudinal axis 42, to form both the respective leg cuffs 147 and the side edges 137a and b of the chassis 100. In other embodiments, the leg cuffs 147 may be formed by attaching an additional layer or layers to the chassis 100 at or adjacent to each of the respective side edges 137a and 137b of the chassis 100. In one embodiment, the chassis 100 may also comprise other elastics disposed adjacent the side edges 137 which may cause the article 10 to form into a "U" shape when allowed to relax thereby pulling the interior surface 102 of the front waist region 36 toward the interior surface 102 of the back waist region 38. In one embodiment, referring to Fig. 14, the article 10 may comprise an elasticized waistband 112a and b. The elasticized waistband may provide improved fit and containment and may be configured to elastically expand and contract laterally to dynamically fit a wearer's waist. The elasticized waistband may extend longitudinally outwardly from the waist edge of the absorbent article 10 toward the waist edge of the absorbent core 200. In one embodiment, the absorbent article 10 may have two elasticized waistbands, one positioned in the back waist region 38 and one positioned in the front waist region 36, although other pant embodiments may be constructed with a single elasticized waistband. The elasticized waistband may be constructed in a number of different configurations including those described in U.S. Pat. Nos. 4,515,595 and 5,151,092. The flaps 189 (a-d) may be discrete from or integral with the chassis 100. A discrete flap is formed as separate element, which is joined to the chassis 100. In some embodiments, this includes a plurality of flaps, e.g. 2 or 4 (often referred to as ear panels or side flaps) being joined to the side edges 137 a and b of the chassis in the front and/or rear waist regions 36 and 38 (see Figs. 12-17). In other embodiments this may include a front and/or back belt-like flaps ("belts") being joined across the front and back (or rear) waist regions of the chassis 100, at least across end edges of the chassis 136 and 138 (see Figs. 12 and 19). In some embodiments the waistbands 112 can overlap the flaps to create a continuous belt-like structure (see Fig.14). The belt-like flaps and may comprise an inner nonwoven layer and an outer nonwoven layer and elastics there between. The inner and outer nonwoven layers may be joined using adhesive or thermoplastic bonds. Various suitable belt- like flap configurations can be found in U.S. Pub. No. 2013-0211363. The absorbent article may also include a fastening system. When fastened, the fastening system interconnects the front waist region 36 and the rear waist region 38 resulting in a waist circumference that may encircle the wearer during wear of the absorbent article 10. This may be accomplished by flaps 189 a and b in the back waist region interconnecting with flaps 189 c and d in the front waist region or by flaps in the back waist region interconnecting with the chassis 100 in the front waist region. The fastening system may comprises a fastener 53 a and b such as tape tabs, hook and loop fastening components, interlocking fasteners such as tabs & slots, buckles, buttons, snaps, and/or hermaphroditic fastening components, although any other known fastening means are generally acceptable. The fasteners may releasably engage with a landing zone 118, which may be a woven or nonwoven. Some exemplary surface fastening systems are disclosed in U.S. Patent Nos. 3,848,594; 4,662,875; 4,846,815; 4,894,060; 4,946,527; 5,151,092; and 5,221,274. An exemplary interlocking fastening system is disclosed in U.S. Patent No. 6,432,098. The fastening system may also provide a means for holding the article in a disposal configuration as disclosed in U.S. Pat. No. 4,963,140. The fastening system may also include primary and secondary fastening systems, as disclosed in U.S. Pat. No. 4,699,622. The fastening system may be constructed to reduce shifting of overlapped portions or to improve fit as disclosed in U.S. Patent Nos. 5,242,436; 5,499,978; 5,507,736; and 5,591,152. Further, the inner leg cuffs of the first and second chassis may have identical component cross sectional order and disposition in at least one of the front waist region, back waist region, and crotch region. The distance from the left outer cuff distal edge to a right outer cuff distal edge may the same. The distance from the left inner cuff proximal edge to left outer cuff distal edge may be the same. The distance from the left inner cuff proximal edge to the right inner cuff proximal edge is the same. The lengths of the inner and outer cuffs are the same. In some embodiments, different size offerings in an array may have identical or substantially identical chassis as the flaps or belts may be used to enable the absorbent article to fit different sized wearers. For example, first and second absorbent articles may have identical chassis (compositionally, dimensionally, cross-sectionally), but the first article may have a different length due to disposition of the belts, such that the first article may be targeted to fit a smaller wearer than the second article. As a second example, first and second absorbent articles may have identical chassis (compositionally, dimensionally, cross-sectionally), but the first article may have a different length and/or width due to the size of the belts, such that the first article may be targeted to fit a smaller wearer than the second article. This method is used to prepare pant type products for subsequent dimensional measurement. The method provides a consistent means of opening a product that has been removed from a bag. This method is applicable to all forms of pant products. A constant rate of extension tensile testing machine with computer interface is used. "C" (304) and "O" (305) Bar attachments each with a rod radius of 9.50 mm that extend longer than the length of the longest side seam. Refer to FIG 20. The bars are mounted horizontally in the tensile tester with their longitudinal axes in the same vertical plane and with upper bar mounted directly above the lower bar. Calibrate tensile tester equipment according to the instrument manufacturer's recommendations. The initial gauge length is determined by removing 10 sample products from the bag, unfolding the pant products (307) and laying them flat as illustrated in Fig. 21, below and measuring the distance between the sides of the pant at the waist as shown (306). The average of the waist measurement will be used as the initial gauge length for the specific set of specimens. The initial gauge length is the distance from the uppermost edge of the upper bar to the lowermost edge of the lower bar. Apply the whole product (307) to the bars as shown in FIG 22 while minimizing manipulation of the specimen. Remove the specimen from the bars while minimizing manipulation. Lay the specimen flat with the front side facing upward as shown in Fig 6. Relaxed Product Length is the longitudinal distance between the longitudinally distal most point in the crotch region and the longitudinally distal most point along the front waist edge. The longitudinal distance is measured parallel to the longitudinal axis of the product. Refer to Fig. 6. Relaxed Product Hip Width (301) Relaxed Product Hip Width is the lateral distance from the laterally distal most point of the left side edge of the product at the upper edge of the left leg opening to the laterally distal most point of the right side edge of the product at the upper edge of the right leg opening. Refer to Fig. 6. The lateral distance is measured perpendicular to the longitudinal axis of the product. Relaxed Product Waist Width (302) Relaxed Product Waist Width is the lateral distance from the distal most point at the right side of the front waist edge to the distal most point at the left side of the front waist edge. The lateral distance is measured perpendicular to the longitudinal axis of the product. Refer to Fig. 6. Relaxed Product Side Length is the linear distance from the point of intersection between the waist edge and the side edge of the product to the point of intersection between the top of the leg opening and the same side edge of the product. The relaxed product side length measurement is the average of the measurements from the left and right sides of the product. Refer to Fig. 6. (b) a larger Relaxed Product Waist Width (302) than the first absorbent article; wherein a Product Waist-to-Side Silhouette of the second absorbent article is equal to or greater than a Product Waist-to-Side Silhouette of the first absorbent article; and wherein the first package and the second package are in the same array. 2. An array of packages comprising two or more different sizes of disposable absorbent articles, the array comprising: a first package comprising a first disposable absorbent article, the first absorbent article comprising a first topsheet, a first backsheet, a first absorbent core and a first pair of side seams, the first absorbent article being a first size and in closed form; a second package comprising a second disposable absorbent article, the second absorbent article comprising a second topsheet, a second backsheet, a second absorbent core and a second pair of side seams, the second absorbent article being a second size and in closed form; wherein the first and second sizes are different; wherein an Array Average Product Waist-to-Side Silhouette of the first and second packages is from about 1.7 to about 6.0; and wherein the first and second packages are in the same array. (b) a larger Relaxed Product Waist Width (302) than the first absorbent article; wherein the third package has a Product Waist-to-Side Silhouette equal to or greater than a Product Waist-to-Side Silhouette of at least one of the first and second absorbent articles. 4. The array of packages of any of the preceding claims, wherein the first and second absorbent articles of the first and second packages comprise at least substantially identical chassis with regard to chemical composition. 5. The array of packages of any of the preceding claims, wherein the first and second absorbent articles of the first and second packages comprise chassis having identical cross- sectional dispositions in at least one of a front, back, or crotch region. 6. The array of packages of any of the preceding claims, wherein at least one of the first and second pair of side seams are refastenably engaged. 7. The array of packages of claim 3, wherein the third package has a Product Waist-to-Side Silhouette is greater than a Product Waist-to-Side Silhouette of each of the first and second absorbent articles. 8. The array of packages of claim 3, wherein the third package has a Product Waist-to-Side Silhouette is greater than a Product Waist-to-Side Silhouette of the first absorbent article, but less than the and second absorbent article. 9. 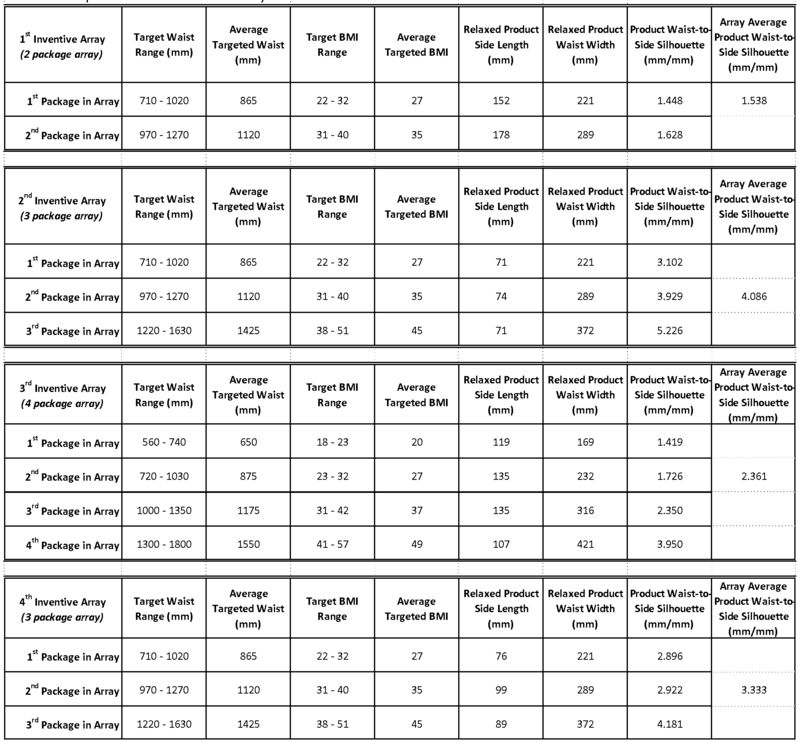 The array of packages of any of claims 2 and 4-6, wherein an Array Average Product Waist-to-Side Silhouette of the first and second packages is from about 1.7 and 4.0. 10. The array of packages of any of claims 2 and 4-6, wherein an Array Average Product Waist-to-Side Silhouette of the first and second packages is from about 1.7 and 3.0. 11. The array of packages of any of any of the preceding claims, wherein the array of packages is an On-Line Array. 12. An adult incontinence disposable absorbent article having a Product Waist-to-Side Silhouette from 1.7 to about 5.0, wherein the adult incontinence disposable absorbent article is in closed form. 13. The absorbent article of claim 12 having a Relaxed Product Length (300) is at least about 640 mm. 14. The absorbent article of claim 12 having a Relaxed Product Length (300) is at least about 500 mm. 15. An array of packages comprising two or more different sizes of disposable absorbent articles, the array comprising: at least two packages; wherein an Array Average Product Waist-to-Side Silhouette of the at least two packages is from about 1.7 to about 4.0; wherein the at least two packages comprise the same brand name and/or sub-brand name; wherein the at least two packages comprise adult incontinence disposable absorbent articles in closed form. ES2223355T3 (en) 2000-08-14 2005-03-01 THE PROCTER &amp; GAMBLE COMPANY Closing device for a container.